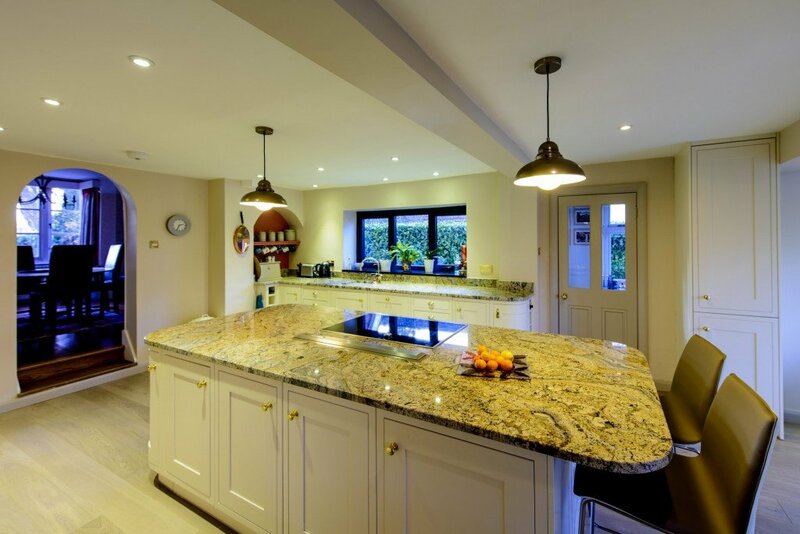 Mrs B of Betchworth chose Paisley Gold Granite, a lovely exotic stone we bought through suppliers StoneWorld of London. 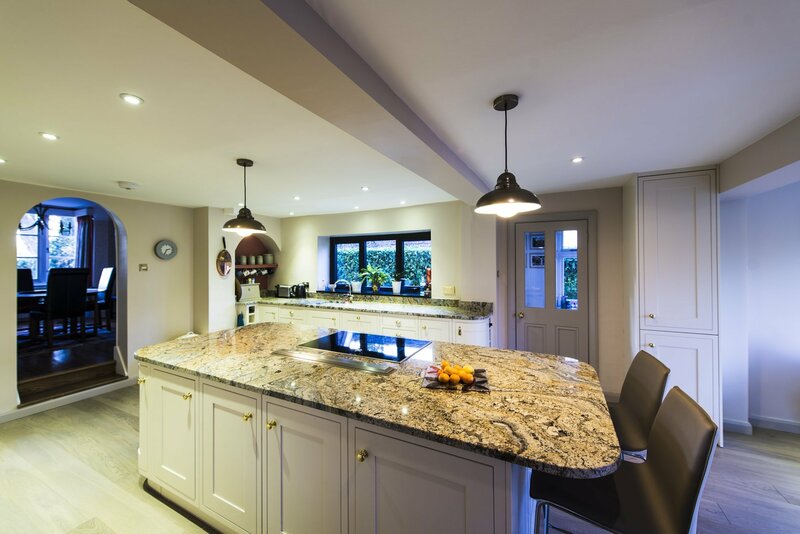 Her cream in-frame-door units and neat gold handles give the kitchen a classic look which is well suited to dramatic and obviously natural stone worktops. 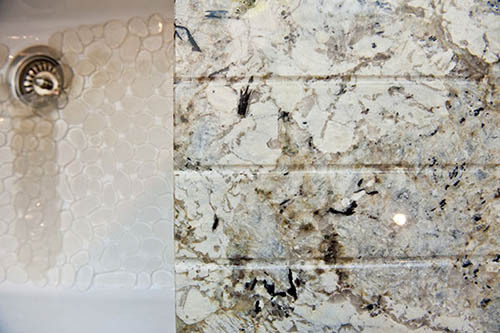 Granite slabs are obviously of finite size. Sometimes that means that bespoke installations are very wasteful, and seem extremely expensive. In this case, the slabs were used up amazingly efficiently by the worktops and upstands. On templating our customer requested a windowsill which could not be made without buying in a further slab, which would have made it a very pricey sill indeed. The solution was to make the sill in Nero Assoluto granite. The smart black coordinates with the aluminium window frame and also with the black features in the Paisley Gold. 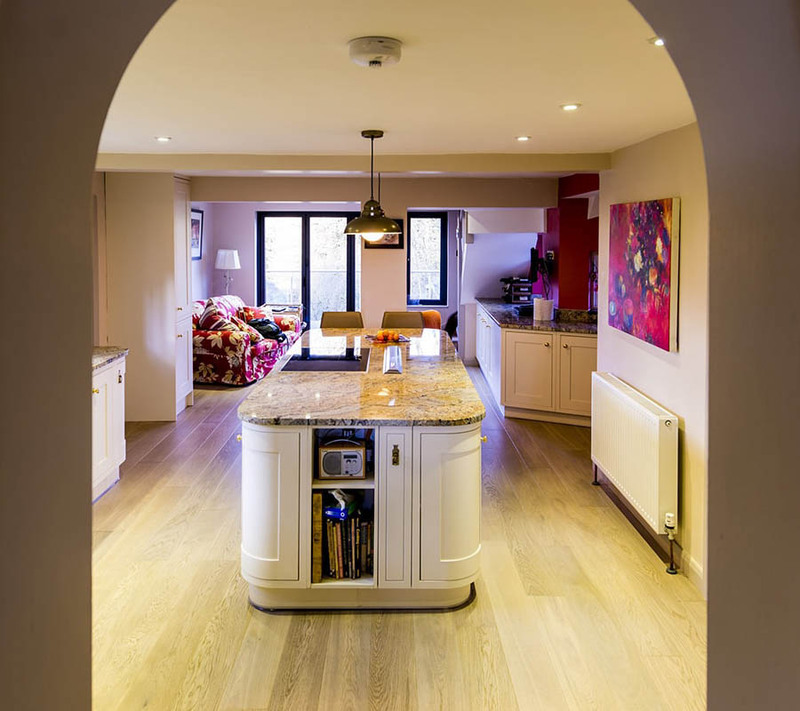 As you can see, the kitchen was photographed in a mixture of lighting, with strong natural light fromwindows and doors and two or three different colours of artificial light. This has led to a photographic challenge, although by no means unpleasant in the room in practice. Rather, the stone of the worktops seems to respond like a living thing, shifting in shade with the changing light, constantly giving something new. The overhang for the breakfast bar at one end of the island has large radius curves, echoing the curved corner units at the door end of the room. The sink and windowsill layout, with parallel drainer grooves and Nero Assoluto granite sill. The sink and windowsill layout, with drainer grooves and Nero Assoluto sill. 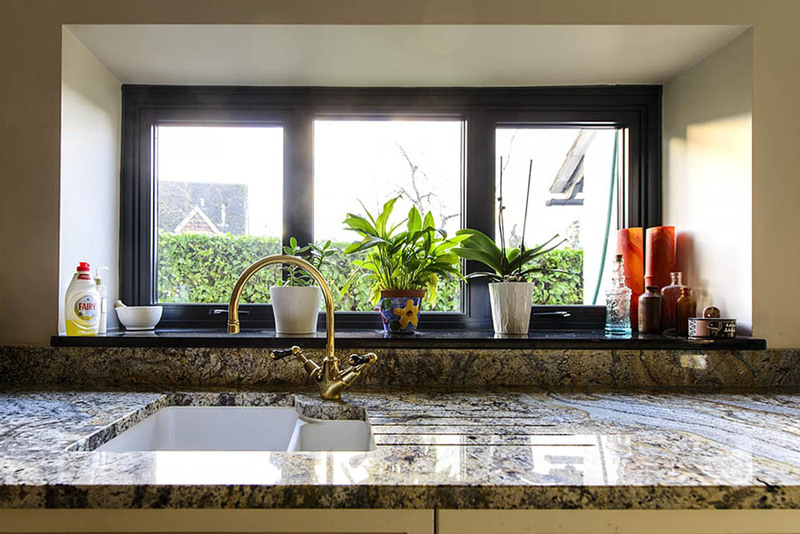 This granite was chosen as the sill could not be made from the Paisley Gold slabs, but the chosen granite is perfect, matching the black window frame and linking with black elements in the worktops. 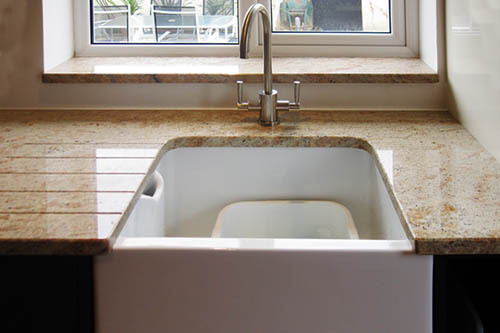 The white ceramic Villeroy and Boch sink is classical in style but practical in use. 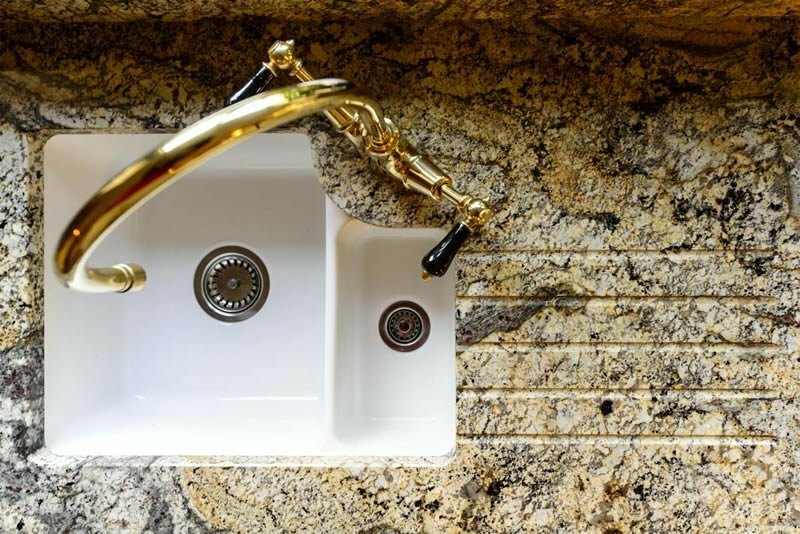 The gilt twin-lever tap is suited to the look of the kitchen and blends perfectly with the colour tones of the stone. Strong, cool window light. The white ceramic Astracast Lincoln sink is classical in style but practical in use. The gilt twin-lever tap is suited to the look of the kitchen and blends perfectly with the colour tones of the stone. Strong, cool window light. View straight down onto the island showing the relative positions of the retractable extractor fan and the induction hob. Warm artificial light. The Best extractor fan is quiet in operation and highly effective. 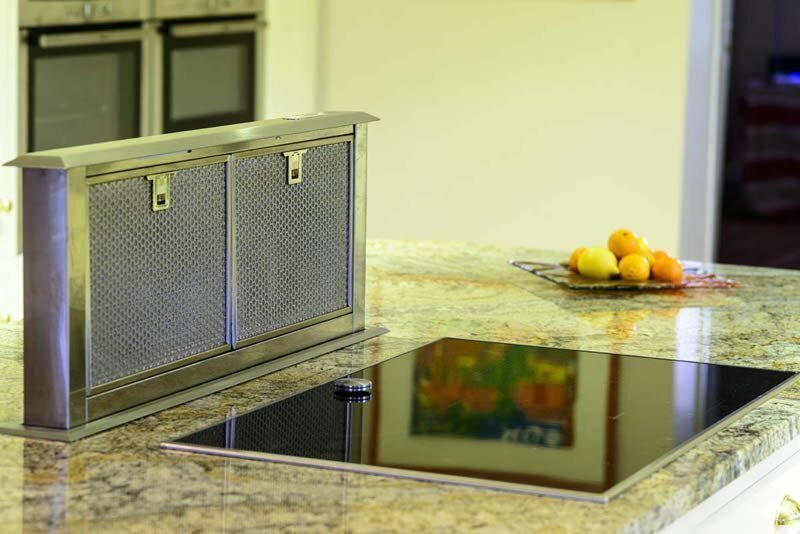 Although not a cheap option, these units are invaluable for island hobs where ceiling height or other practicalities prevent the use of a more traditional extractor. 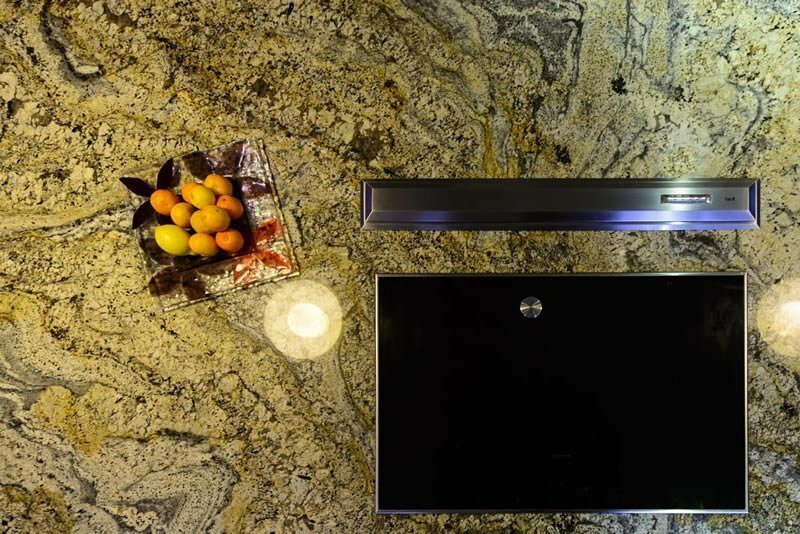 On islands and in rooms with low ceilings, a pop up extractor is a good option. 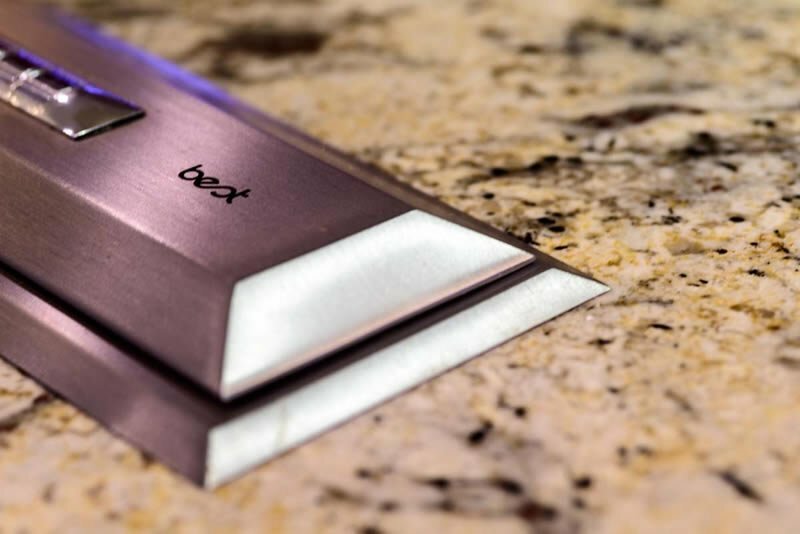 The Best extractor fan is quiet in operation and highly effective. The wild gold patterning of the stone perfectly complements the shine and look of the gilt door furniture. The wild cream, black and gold patterning of the stone perfectly complements the shine and look of the gilt door furniture. 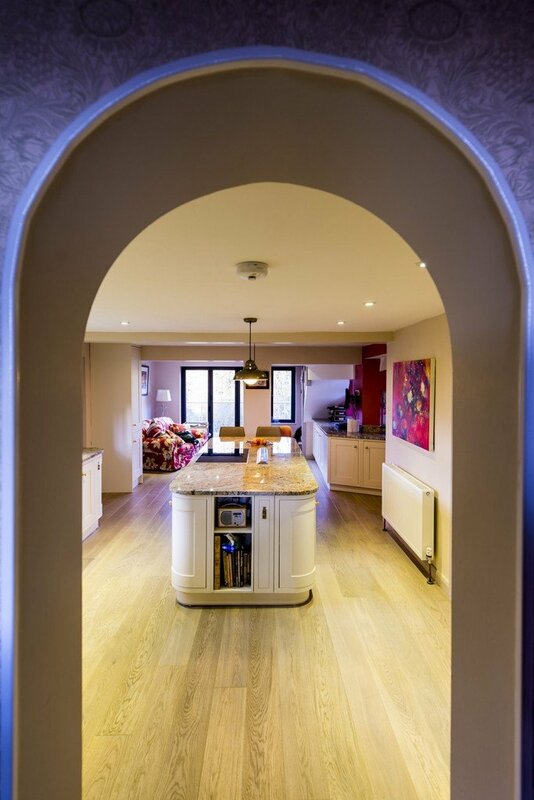 The arched entrance to the kitchen contributes to the charm of the traditional look kitchen and coordinates with the large curves on the island. 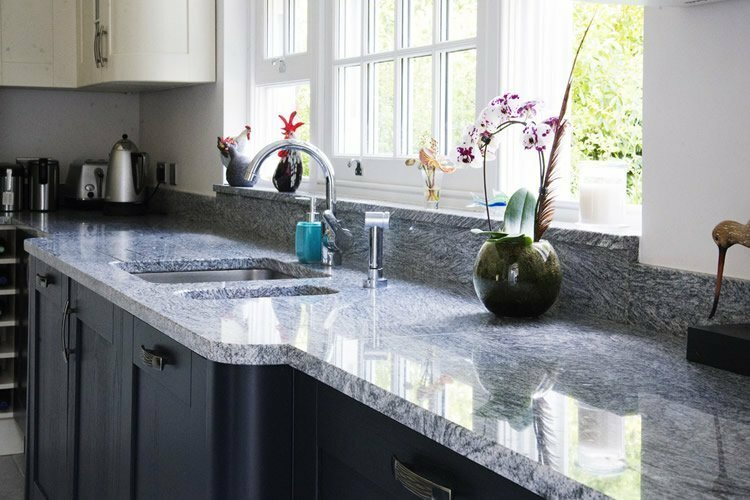 In an older, country home with a number of arched doorways, the choice of curved corner units and curves in the worktops makes perfect sense. 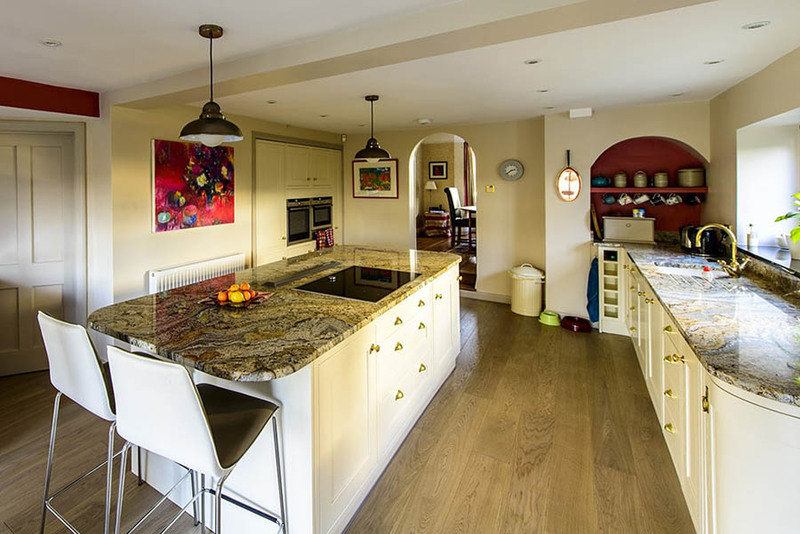 A brand new kitchen and worktop installation feels “right” for the house. Close up of the retracted extractor fan housing, reflecting the pinkish purple light from across the room. Close-up of the retracted extractor fan housing, reflecting the pinkish purple light from across the room.